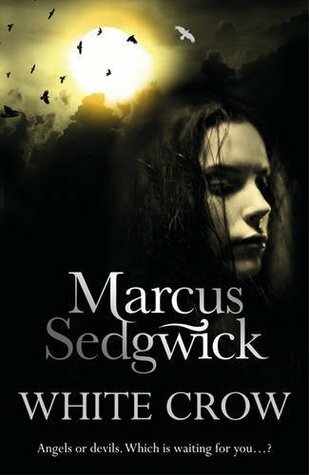 I had heard interesting things about Marcus Sedgwick's books, particularly Midwinterblood and My Swordhand is Singing. So when one of the books that I got from Gollancz was his book White Crow, I was mildly intrigued, though the blurb was a bit too vague for my tastes. I might well have picked up another of his books because of the cool titles, but otherwise this might well have been an author that would have passed me by. I feel like this could have made two really good books. There are two main plot-lines that the reader follows. A modern day story of Rebecca, a girl who has retreated to the countryside with her father after some scandal has made him something of a pariah, and her strange "friendship" with local girl Ferelith. This is juxtaposed with a story set two centuries before, chronicling the experiments of a priest and the newest member of his parish, Dr Barrieux, as they try to determine once and for all what is in the afterlife. Both are set in the village of Winterfold, a seaside settlement that used to be a hub for trade, but has been eaten away over the years as the sea erodes the cliffside. While both plot-lines work and have some thematic ties, I don't think that both were essential for the book to have. As it was, there were problems in both that I think could have been remedied by dropping one or the other entirely. In both, there was a lot of story to get through and half as much space needed; there were certain things that I thought would get at least some explanation, but were still only vaguely alluded to by the end, which I will discuss below. So, the modern story-line. I thought it was kinda toothless. Yeah, there is something a bit unnerving about Rebecca's friendship with Ferelith, but I knew so little about them as individuals that it fell flat. Yes, I know a little bit about Ferelith's unfortunate family history, and yes I know a little bit about what drove Rebecca and her dad to leave London for this village in the middle of nowhere. There are two problems with this. One, I still only know what is essentially a cliffs-notes version of their pasts, nothing actually resembling details, hows and whys. Two, they don't really have much beyond their pasts, so I know how they react to personal tragedy, but nothing about what they're like in day to day life. Heck, it was so poorly conceived that by the end, I can tell you more about Ferelith, the girl who is supposed to be mysterious and strange, than I can about Rebecca, the girl who is presumably supposed to be the audience surrogate. Additionally, by the end of the modern plot, it didn't really feel like much had really been achieved. Sure, Rebecca gets a bit of emotional closure, but that didn't resonate anywhere near as much as the author wanted it to; see above point. On balance, I did prefer the historical plot, which makes its own failings all the more frustrating. But first, the things that I liked about it. Mainly, I liked that it was a genuinely creepy story of two men trying to meddle in realms that they cannot and should not understand, with a build-up that is absolutely full of suspense. The thought of an entire book about a futile and dangerous attempt to find evidence of an afterlife is one that fills me with glee. The problem with this was, again, the characterisation, even more so than in the modern story-line. If I could have heard more about the tantalising backstory elements that the author tempted me with, instead of yet more hypocritical whining from the priest character, then this could have been enough to save the book entirely. I wanted to know more about Dr Barrieux's dead wife and child, more about the cult that the priest grew up in before he found God, more about the village's growing suspicion. Instead I got the priest repeatedly angsting about how he finds it so easy to visualise Hell, but not Heaven.